"...the greatest meeting of land and water in the world." 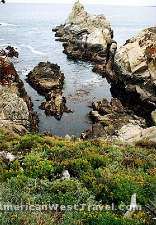 Few who visit the Point Lobos State Reserve in Carmel, California, will challenge the brief but extravagant sentiment (above) of landscape artist, Francis McComas. 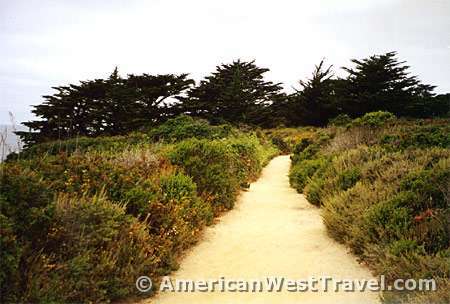 The landscape here features bold headlands dotted with the rare and beautiful Monterey cypress, irregular coves and rock islands rich with marine life, and rolling meadows lush with wildflowers. 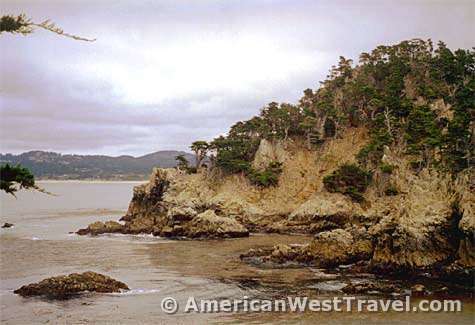 Marine life flourishes at Point Lobos which is considered one of California's richest marine habitats. 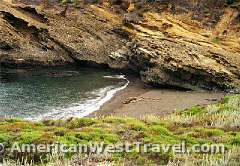 The mineral-rich waters provide abundant nutrients to the kelp beds and other plant life which in turn supports a huge number of animals. 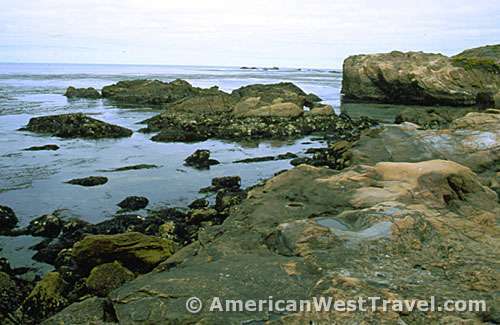 At right, harbor seals stay close to shore and are easy to see. (The photo right is a closeup of the lower left, photo top.) 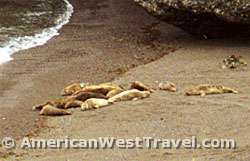 Larger sea lions congregate on the offshore rocks. They are more difficult to spot but you can hear their constant barking. 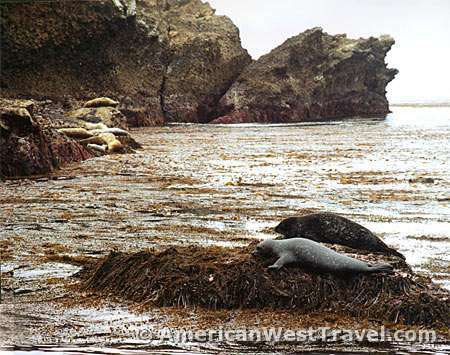 The rare sea otter generally is found floating in the beds of seaweed. Unfortunately we did not spot one on this visit. Migrating gray whales are often spotted offshore during the winter and early spring. Above, a large group of harbor seals enjoy a sheltered cove. Unlike the rowdy sea lions, the seals don't make any noise and seem to spend much of their time snoozing. The reserve is also the home of one of only two naturally growing stands of Monterey cypress trees remaining in the world. 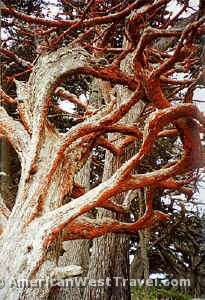 The cypress can thrive only on rocky, fog-shrouded headlands. The exposure to ocean storms and the elements of the sea results in the gnarled limbs and fanciful shapes which everyone recognizes as a Monterey cypress. At right, even a dead cypress offers beauty, its limbs encrusted by algae borne on the sea air. At left, the lush meadows above the headlands appears as neat and symetrical as a planted garden. 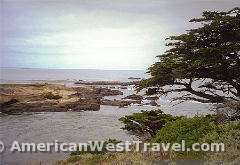 The Allan Memorial Grove of Monterey cypress trees, name for their original benefactor, is in the background. 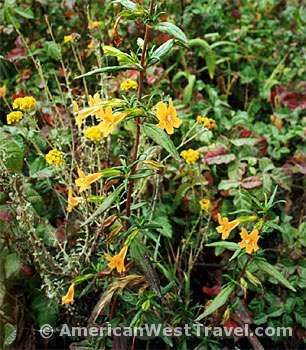 Many wildflowers bloom year-round, such as the sticky monkey flower at left. 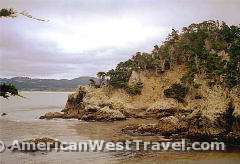 Point Lobos is a state reserve rather than a state park. The distinction is that a reserve is intended primarily to preserve a special natural environment in an undisturbed condition. Public usage must be within the framework of preservation. So there are more rules and restrictions here than at a typical park. For example, the reserve is open only for day use and no more than 450 people are allowed in the reserve at any one time. 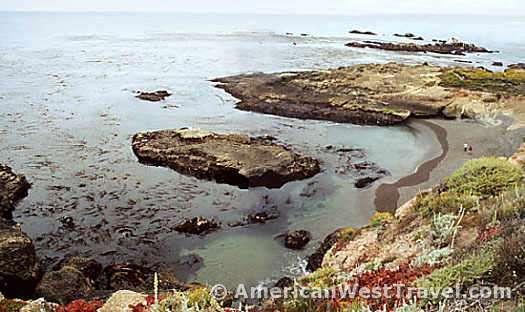 Every effort is made to preserve Point Lobos in its superb pristine condition. If you visit here. please follow all the rules.